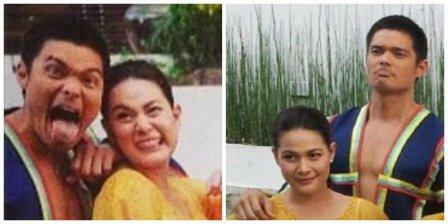 Bea Alonzo and Dingdong Dantes Filming their First Movie Team-Up Under Star Cinema! Bea Alonzo and Dingdong Dantes were paired for the first time in a new movie under Star Cinema. Yes, Dingdong, the prime Kapuso actor will do another exciting movie for Star Cinema, the movie arm of ABS-CBN for the third time! After Kris Aquino and Angel Locsin, Dingdong is now paired to Bea Alonzo! Bea and Dingdong were now filming for their exciting movie with a romance-comedy genre. According to the entertainment site Mykiru, the two stars began shooting last Friday, August 16, 2013. The casts were wearing the traditional Pinoy costumes. In the movie, Bea and Dingdong are playing the characters of Cat and Wacky. Joining the cast members are Maricar Reyes, Guji Lorenzana, Coleen Garcia, Erika Padilla, Marc Solis, RS Francisco, Garlic Garcia and Daniel Matsunaga. Aside from Mykiru, the said photos were also shared and posted in the Instagram accounts of Marc Solis, Guji Lorenzana, RS Francisco, and Bea Alonzo.